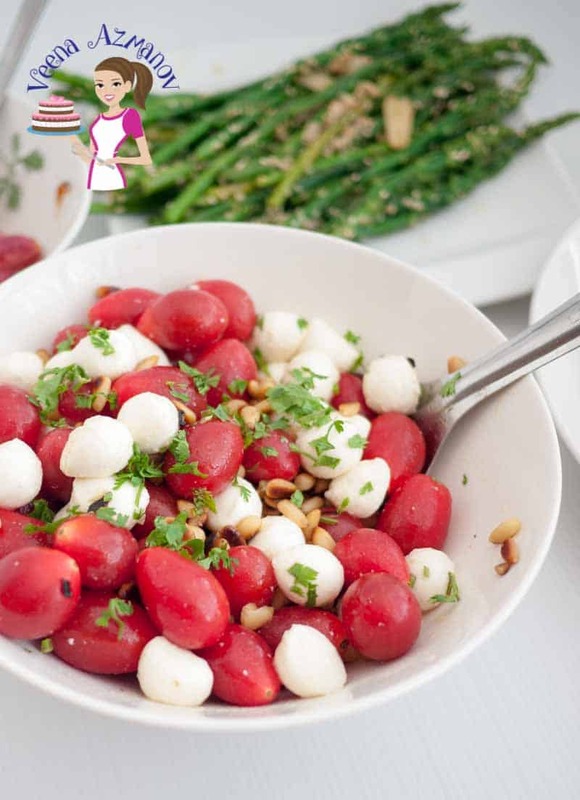 This tomato Mozzarella salad is a great twist on the Italian Classic Caprese Salad with toasted pine nuts. Simple, Easy and always refreshing this salad takes less than five minutes to put together. 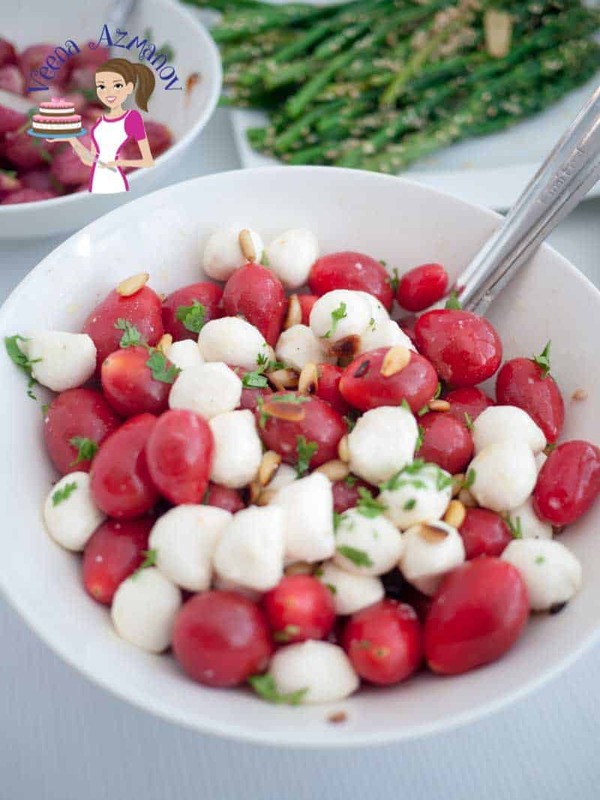 Nothing beats sweet juicy cherry tomatoes with soft mozzarella balls, crunchy pine nuts, and refreshing basil. Don’t you agree? My favorite part of this salad is how quick and easy it is but how absolutely glorious it looks on a dinner table. Next time you get invited to a BBQ party, choose to bring a salad. This tomato and mozzarella salad makes a grand entry because it’s always so popular with kids and grown-ups. Tomatoes – Traditionally we use tomato slices for a Caprese salad but trust me when I say buy cherry tomatoes. These are sweet, juicy and burst deliciously in your mouth. 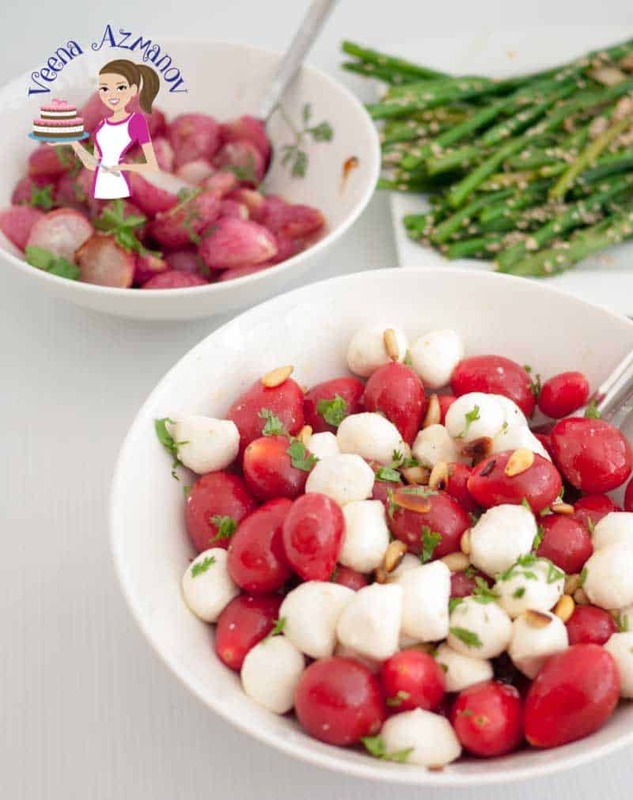 Mozzarella – You can use a block of mozzarella and cut it into cubes. I love these little mozzarella balls because they look so cute. Kids are the most fascinated with it. 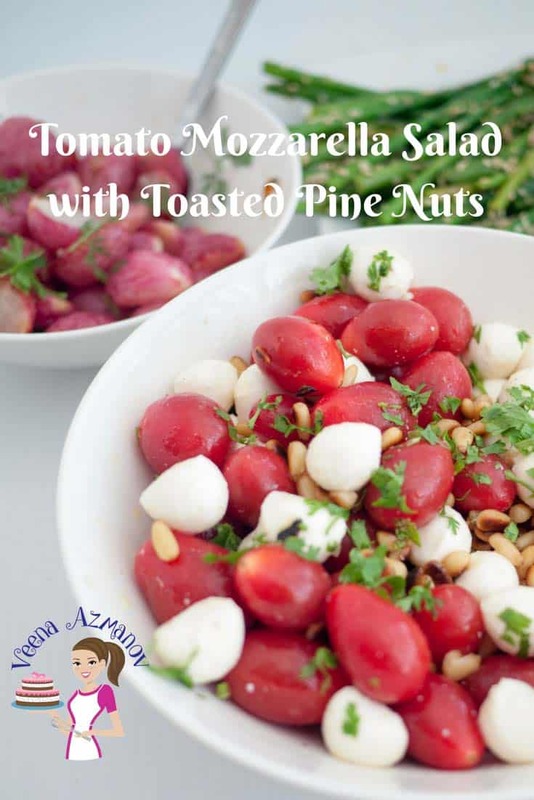 Pine Nuts – a bit of a middle eastern twist on this Italian classic but pine nuts are absolutely incredible when toasted and added to a salad. Not to mention they are incredibly nutritious and healthy too! Basil – I love to tear them into small pieces here so they don’t steal the show, but mostly because my kids ignore them when they are so small. My kids pick the large leaves out. Olive Oil – A good quality olive oil is an absolute must in this salad. The flavor is just unbeatable. Vinegar – I use apple cider vinegar most often but a good balsamic works treat too! It’s a family favorite and you will love it. Drain Mozzarella from water – If using a block cut into cubes. Leave the mini balls as is. Add them to the dressing. Tear Basic leaves and add to the salad. Pour the dressing over and give it all a good mix. Cover with cling wrap and let chill in the fridge for an hour or more until serving. Drain Mozzarella from water - If using a block cut into cubes. Leave the mini balls as is. What an easy, delicious salad to whip up in a hurry. Simple ingredients that produce great results. I love the addition of pine nuts for the great texture too. Thank you Gloria.. I love the pine nuts in there too! This is one of my favorite Italian salads/antipasti! I usually prefer it with balsamic vinegar, but I’ve never tried it with cherry tomatoes before. What a great idea! Kudos on a such a lovely post!